At the 2015 Consumer Electronics Show in Las Vegas, NV, there were curved computer monitor screens literally everywhere. There were also a variety of curved television and smartphones as well, but the abundant amount of curved PC monitors was the main center of attention and virtually dominated the “curved screen design” vicinity of the international CES show floor scene. There were some pretty remarkable demonstrations of the curved pc monitor displays, especially when it came down to the multi-monitor set-ups. Even though there has been some significant skepticism about exactly how beneficial the curved computer screens can really be, both the LG and Samsung companies had some very impressive curved monitor exhibitions that might just put that skepticism to rest in the near future. LG was portraying a huge wall of 6 fascinating curved computer monitors that were being used as control panel for business and investing, while Samsung was presenting its new all-in-one computer, with an extraordinarily immersive environment optimized for gaming, which consisted of 3 curved PC monitors. The curved computer display setups exhibited an appealing effect of having your business or gaming environment literally “wrapped” around you. Additionally, there’s an advantage of having the radius between the curved screen and your eyes stay consistent, as this has the potential to drastically reduce the amount of strain on your eyes. Hewlett-Packard and Dell have also joined the curved PC monitor scene; both companies have announced their plans to release their own 34-inch versions of these computer monitors that will be sporting the innovative new curved design. 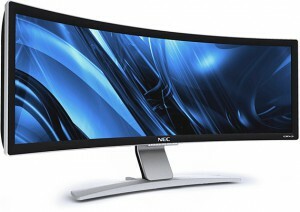 One of the main reasons that these captivating new curved PC displays will most likely be the future of computer monitors is because computer users sit closer to their PC screens, making the overall viewing experience more unique and enjoyable than that of at curved screen TV, where users sit further away from the screen. This makes the curved screen design somewhat more valuable as a PC monitor than as a smart TV screen. The Dell Ultra Sharp 34-inch curved monitor will be selling for $1199.99 and the LG 34-inch will be selling for $1299.99. Samsung is planning to launch its version of the new curved monitor sometime in the first half of this year, but have not yet announced an official price.